Who doesn't love potatoes?? 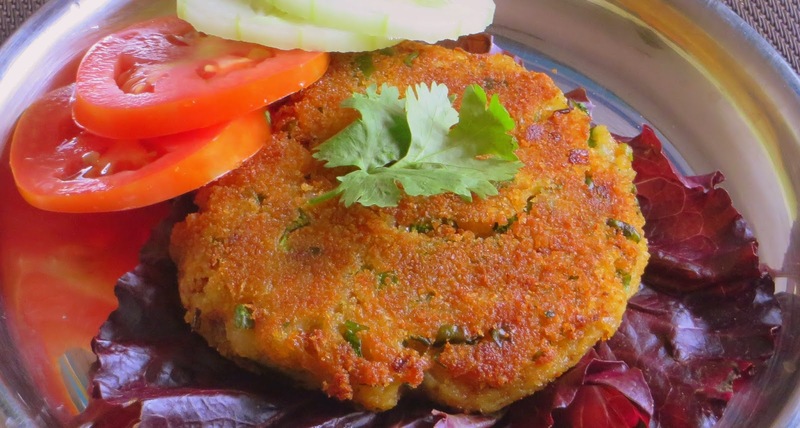 In this recipe, aloo/potato has taken a shape of a patty. Just one full burger with this patty is good enough to fill your stomach. We had tomato soup to go with this burger for lunch and it became a wholesome meal and for at least the next 3 full hours, we din't feel a bit hungry. 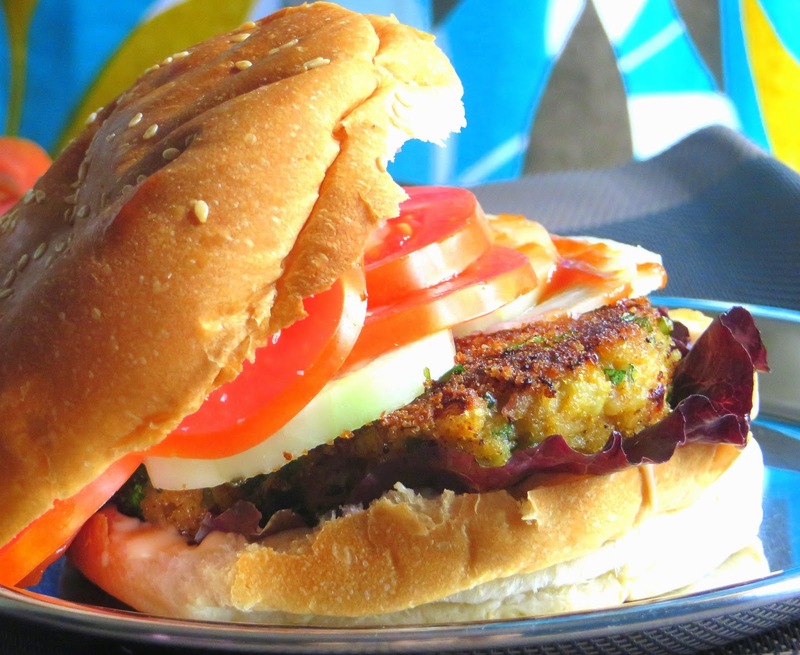 There are many versions of vegetable burger depending upon the fresh vegetables used and the type of patty used which can be either a mixed vegetable patty, aloo tikki, simple potato hash browns or a even a simple aloo patty that is lightly spiced. 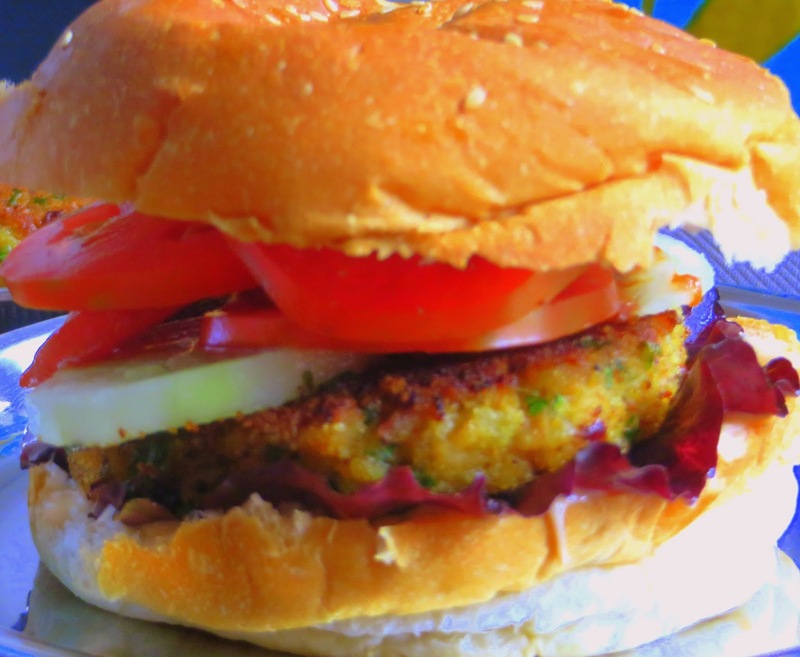 Coming to the recipe, for this vegetarian burger, I have prepared a potato patty that is mildly spiced with Indian flavours. Its quite simple and tasty too. These patties are a great party starters that can be served hot with ketcup. If you have the boiled potatoes ready, the total time to make the patty and assemble the burger ingredients and build the burger tower just takes around 20 to maximum 30 minutes. Here's the recipe. Grate the boiled potatoes and transfer to a mixing bowl. Add salt, pepper powder, finely minced green chillies and finely cut coriander leaves. Mix well using a fork. Keep it aside. Heat oil in a pan. Temper cumin seeds. Add the finely cut onions and ginger. Fry for a minute and add turmeric powder, salt, chaat masala powder, and garam masala powder. Note: If onions are not used, then, all of the ingredients that are added to the onions (except oil) can be directly added to the potato mixture. Turn off heat and add it to the potato mixture. Add a tablespoon of bread crumbs and mix well. Take a handful of this potato mixture and make a ball. Press on top to shape it like a patty. Dip in a plate of bread crumbs generously both sides and arrange them in a plate. Heat at least 4 tablespoons of oil in a wide bottomed non stick fry pan. Place the patty and cook on both sides until its browned. Make sure the patties are handled carefully as it can break apart. Carefully arrange the cooked patties in a plate and cool them. Toasting the burger bun is optional. Place the bottom side of the burger. Apply mayonnaise. Place the lettuce. Place one big aloo patty. Top it with cheese slice (if using), sliced tomatoes and cucumbers and onions too. squeeze some tomato ketchup and close the burger tower with the top side of the burger bun. Serve it with french fries and/or soup and/or salad. I wish all my blog readers advance Independence day wishes. Jai Hind !! Every Independence day, I try exhibit my patriotism by cooking something that is tri colour - saffron, white and green. I would like to share one of those recipes to all my patriotic readers. 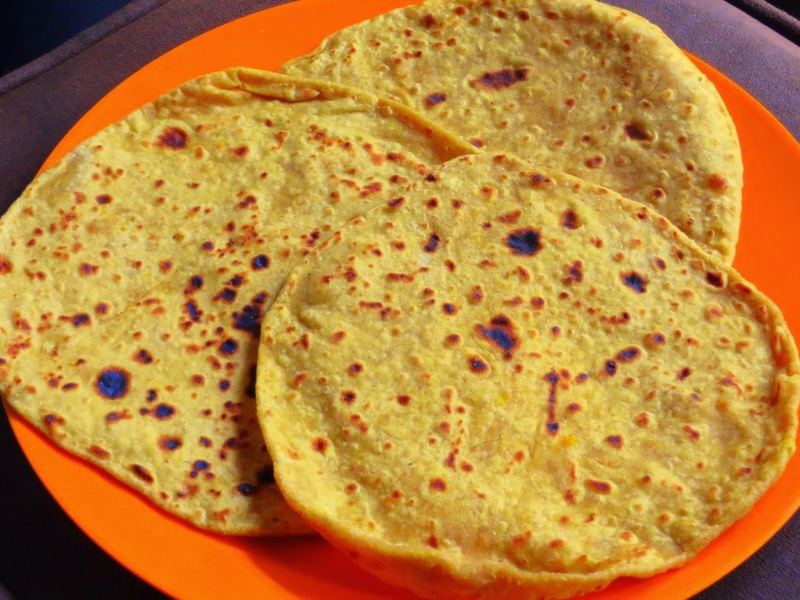 I am posting this recipe a couple of days before the Independence day, as you can buy the necessary ingredients in advance if you are going to try this recipe. 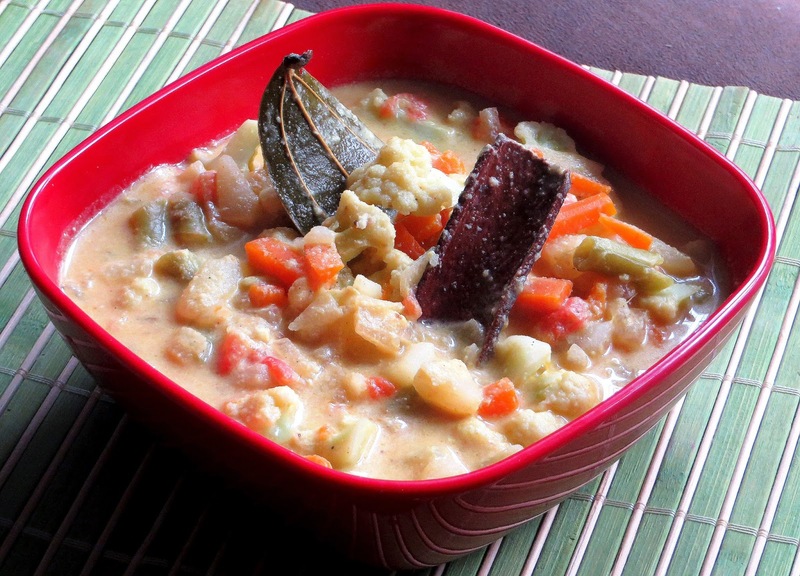 This is a simple, quick and delicious kurma that's totally vegan. This is a very versatile gravy, so, depending upon the quantity of kurma needed, you can adjust the quantity and choice of vegetables as per your taste. 1. Wash the cauliflower florets and add them in boiling water and cook for 4 to 5 minutes and turn off heat. drain water and keep it separately. 2. Heat oil in a non stick kadai. Temper the cumin seeds and add bay leaf, cinnamon, cardamom seeds, cloves, green chillies and fry for a minute. 3. Add onions and fry till its translucent and add tomato and cook for a couple of minutes. Add ginger garlic paste and fry for a minute. Skip onion or tomato or ginger garlic paste if you are not using. 4. Now add the mixed vegetables except cauliflower florets and fill with water to just cover the vegetables and add required amount of salt and cook closed until the vegetables are tender. 5. Just when the vegetables are cooked, toss in the cauliflower florets and give a quick stir. 6. Now stir in the coconut milk and wait till one boil and turn off heat. Garnish with coriander leaves. 7. Serve hot with Appam / Roti / Phulka / Chapathi / Parotta / Set dosa or Basmathi rice that's cooked in coconut milk. Cashewnut paste can be added to the gravy for a rich flavour. Grind a handful of cashewnuts to a smooth paste using little water and add to the gravy just when the vegetables are well cooked. Then, pour the coconut milk. Cashewnut paste and Coconut milk reduces the spice level. So, adjust the green chillies accordingly.